I LOVE 4TH of July! I feel like summer has truly started when we get to celebrate with BBQ's and fireworks! I also love all the fun food that goes with it, that doesn't take all day to make! Here are recipes for two of my favorites that scream 4th of July!! My Stars and Stripes Fruit wands and my Celebration Popcorn. Here are my favorite patriotic summer treats that are so EASY to make! 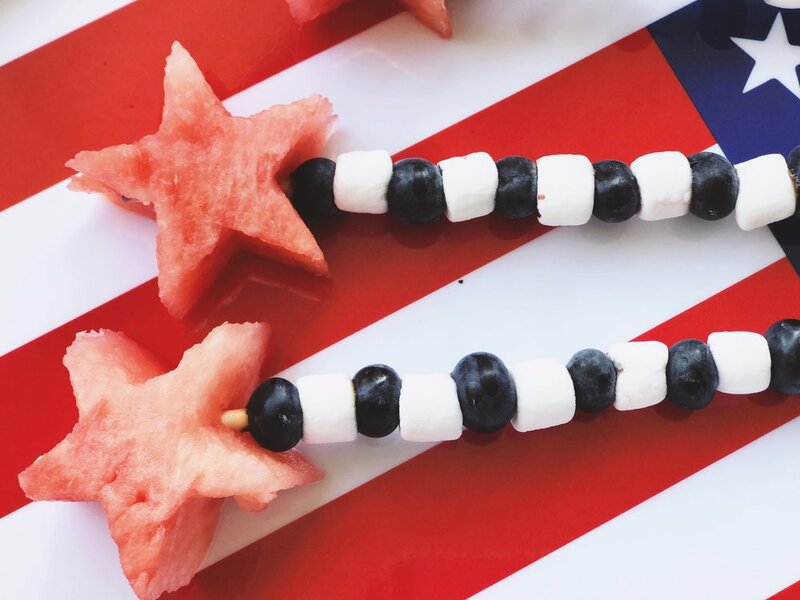 Take your wood skewers and start alternating piercing the blueberries and marshmallows onto the skewer all the way up leaving about an inch and a 1/2 of space for you to finish the wand with your watermelon star. Then slice your watermelon into triangles and use your star cookie cutter, and press down firmly to get your watermelon star. Then gently press into the top of the Blueberry and Marshmallow sticks and Enjoy! Celebration Popcorn is a fun dessert that is a quick as it is yummy! Pop your popcorn and set aside. Take the Popcorn and put it in a container that has a lid so that you will be able to shake it with the white chocolate. Once the white chocolate is melted I drizzle it into the popcorn that is in the container. Please do it sparingly it goes a LONG way! I pour about 1/2 in and then put the lid back on and shake up the popcorn and the white chocolate so it gets an even coating. I like to serve it room temperature. you can also refrigerate and serve later.